THOSE WHO HAVE BEEN THROUGH A TRUE AND EVIDENT BREAKING ARE CALLED TO A NEW REFORMATION. A spiritual revolution that will shake the very substance of what they have experienced in the past. THE LORD WANTS YOU TO KNOW THAT HE IS CALLING YOU OUT OF THE PLACE OF WORRY, FRETTING AND EXHAUSTION! He wants to “re-form” in you a fresh commitment and a greater depth of Mercy that you have not yet tasted from former wineskins. He has been doing a very deep work within the interior of your being. He has been dealing with you in private personal choices and practices. He has been calling you to a level of personal consecration in areas that at one time didn't bother you at all. He is also separating you from some affiliations and movements that have begun to manipulate the power of the anointing for personal gain and glory and have left behind the character education, of a pure and honorable heart. THIS IS ACTUALLY THE LORD DOING YOU A GREAT DIVINE FAVOR! There is going to be a very real and public exposure of some of the people you have related to in past movements. Much like a repeat at Ananias and Sapphirah. There is a masked financial greediness and manipulation that has begun to bring the loving hand of judgment from the Lord to those who have become toxic in the belief that they deserve more, because they assume that they are "anointed" more than others. These people are more interested in impartation rather than instruction and wise counsel and - willing accountability. There is a publicizing of the “super apostle” that is drawing in those who long to be mentored and fathered, on the deception of receiving impartation without first being trained, in the price of what this calling will cost. THE LORD IS CALLING YOU OUT FROM AMONG THEM INTO A FREE AND OPEN PLACE. He is asking you to protect your families and to trust him, to bring you into a fresh newness in the calling he has placed within you. The days of barely surviving to make ends meet are going to end. That is, if you make this step of removing yourself from the last "leashes" of identifying with past affiliations and moves. THE LORD IS CALLING YOU INTO A PLACE OF DAVIDIC FAVOR WHERE YOU WILL RECEIVE FRESH OIL UPON YOUR HEAD AND A FINAL ASSIGNMENT FOR THE NEXT PHASE OF HIS GLORY IN THE EARTH. You are called to be a reformer! Not a just a "reporter" of the things of God. The Spirit of God is laboring and turning inside of your inner man to deliver you to a place of joy. Something that many have not experienced in a long time! THE DAYS OF PASSIVITY ARE OVER FOR THE RISING COMPANY OF APOSTOLIC FATHERS AND MOTHERS NOW EVER SO SLIGHTLY BEGINNING TO EMERGE FROM THE CAVES OF HIDDENNESS. You are now experiencing the blazing upheaval of a spiritual Reformation in all that you wrestle with, and in every arena of your life. The fire sent from heaven’s refining furnace, changes the very environment of the spiritual revolution. It's an illumination and it is lit to be a purifying fire! A fire is intended and planned by God to bring new life. So does a spiritual revolution! Fire devastates and so does a “Cross-focused” revolution. The fire of the Lord does not allow itself to be trapped and controlled. A spiritual revolution is held in God's hands, and restoration fire must be tended to and protected from abuse. Man must take his hands off its development, but must stay with it to protect it and to fan its sparks and to keep the embers red-hot! THE ATMOSPHERE OF THE SPIRITUAL REVOLUTION BRINGS WITH IT THE QUESTIONING AND TESTING OF OUR SECRET ASPIRATIONS. "You listen when anyone in Israel truly feels sorry and sincerely praises with arms lifted towards her temple. You know what is in everyone's heart! So from your home in heaven you answered their prayers, according to the way they live and what is in their hearts." A heaven ignited Reformation fire is like hell to the stubborn and ego driven, and it certainly burns the love of God into every devoted person! It is without a doubt the situation that happens when inside of us there is a personal "re-form-ation" of a softened and melted heart “remodeled” for the sake of the softening and melting the hearts others. A FRESH MOVE OF GOD NEEDS A MAN OR A WOMAN TO STAND IN THE MIDST OF ALL THAT IS RUPTURING AND CRUMBLING! A revolution of the spirit will need people, purified from the need to be "publicly validated" or honored, to finally begin. Moves of God are remembered and documented in the earth by its men and women, those who have the nerve to stand in the place or gap of change. Those who will not allow the fresh streams of promise from heaven to be muddied with religious buzzwords, or glamorous advertisements! Reformation and revolution of the spirit must come God's way, according to God's point of view and intention, but they first must begin in a man's heart, where God does his deepest of works. A man or woman synchronized with the heart of the Lord and leader of the ever-increasing kingdom! A man or woman who is devoted and set apart to be poured out and with a heavenly measuring cup! A man or woman who understands this driving force and who also has the hell fearing power of humility, and welcomes whatever position God has adapted and called them to, according to the Lord's own measure of allowed influence and assignments to lead or instruct others. "I will raise up for MYSELF a faithful priest, who will do according to what is in my heart and mind. if such a man or woman is trained through the weathering of life’s storms, learning to stand, and to stand without giving in to the pressures that taunt and attempt to wear them down. 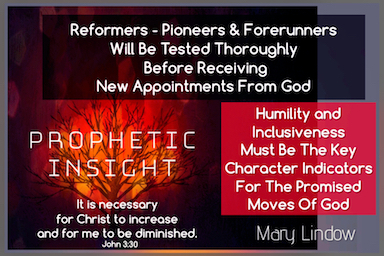 A revolution and a brand-new clarity for being devoted to heavenly causes, will swiftly be ushered in when the people of God are brought back to a holy reverence over the price to be paid in prayer and personal sacrifice on every level, with the willingness to pay the price for the precious move forward to actually happen! Who have I in heaven but you? There is nothing I desire besides you. The world sees strength in the “actions” that man takes to achieve personal success and the size of his portfolio, his belongings and affiliations. it is known that actual strength lies in quietness and in the intentional policy of surrendering power, in order to be "Em-powered." May we be found in this hour of extremes and shaking, to be men and women who value the treasure of a life trained and prepared, in the God appointed caves of weeping and solitude. Out of these "clefts in the rock" there will come forward a company of Saints with the scent of heaven’s fire still on their garments of worship. Look for the fruit of mercy in their hearts, and the evidence of a blessed and humble peace upon their faces. These are the sons and the daughters of the Divinely orchestrated spiritual revolution. And you will be called "sought after", the city no longer deserted." Duplication and sharing of this message is welcomed as long as the complete message, podcast site and website information for Mary Lindow is included.